Since my last update I have done some serious mileage on the Renovo. The best miles were during the Marmotte GranFondo last weekend. 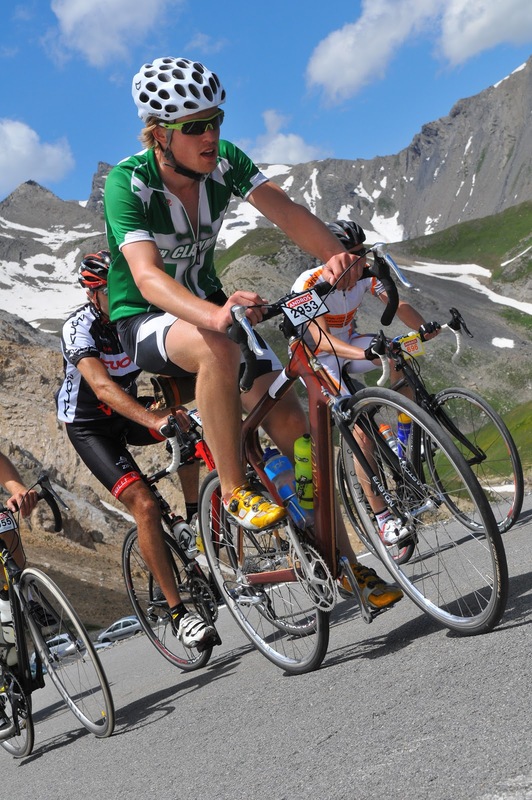 For those of you who don't know the Marmotte: it involves riding over the Col du Glandon, Col du Télégraphe, Col du Galibier and the Alpe d'Huez, which is saying something. Climbs during the Marmotte were pretty tough, mostly because I did not want to change the original DA crankset for a compact or triple. That is why I ended up climbing every mountain on a 39 up front and a 27 in the back. Descending on the other hand was great. The bike just seems to want to accelelarate all the time, which led to some tricky situations in a couple of hair pins. Fortunately I was on aluminium rims, which provided perfect braking performance. Here is a nice picture of me on the bike climbing the Col du Galiber.